August…a great month for doing very little! AUGUST…enjoy the moments, summer won’t last much longer. Several hot, overly humid days early in the month and just a bare sprinkle of rain for over two weeks…even though all the planted areas are heavily mulched, I still need to give the garden a good soaking until the weather decides to cooperate. My sandy soil drains quickly but usually I still only need to water every 7-10 days during hot dry weather…and so far this month I’ve watered just once. Using soaker hoses, covered by mulch, throughout the planted areas is the most efficient way to get moisture to plant roots at this time of the year. I just connect the garden hose from the house bib and turn on for 2 hours and…easy as that the garden is watered. It takes a few times running the system to determine how long to let water run to soak roots…experiment and learn how much water is delivered according to water pressure and well vs. city water. Foliar spraying twice a month with liquid seaweed, especially after a rainstorm or heavy dew, really gives all the plants a boost and helps them stand up to the heat stress. It will also help the early flowering shrubs such as azaleas and camellias set bloom for next season. It always happens, just like washing the car…I finally manage to get the garden watered and later in the evening an unpredicted rain shower blows in and drops about an inch or more of needed moisture…that’s okay, the already moist soil soaked up the rainfall faster, there was less runoff and all the rain barrels are full again! Later in the day, the sun is behind the trees leaving the entire back yard shaded and a bit “cooler”…so I spent a while harvesting herbs and flowers for various projects….and some for a cooling pitcher of fresh, iced herb tea. To make a tea infusion using fresh herbs: I use a large volume of leaves either whole or roughly chopped…about a handful for each cup. Pour boiling water over the leaves in a teapot or jug and let them infuse for at least 5-10 minutes, depending on taste. Sweeten or not with stevia, organic cane sugar, honey or agave and add a few slices of lemon. Cool and pour over cracked ice, top with a sprig of fresh herb…um-mmmmmm…lovely. OR, you can use a big gallon glass jar…fill with fresh water, add some spearmint leaves, lemon verbena leaves, some rosemary sprigs, and some rose petals…let sit in the sun for a few hours and then enjoy at the end of a garden work day…strain the tea, add honey or other sweetener, some ice and enjoy a sunset with quiet peaceful thoughts! Tea made from lemon balm is lemony, soothing and also quite relaxing….it calms, reduces tension and helps insomnia. Or, I sometimes make lavender lemonade by adding lavender buds infused overnight in freshly squeezed lemon juice and sugar syrup made from stevia. Lemon verbena has the freshest, cleanest citrus flavor of any herb, almost more lemony than lemons! The leaves make a delicious calming tea. Fresh leaves are lovely chopped and scattered on fruit salads, added to tea or fruit drinks. Lemon verbena also makes a glamorous, fragrant pot plant. It prefers a warm sunny spot, lots of water and consistent foliar spraying with water…afternoon shade produces a much more fragrant leaf. Regular snipping will encourage new shrubby growth. I grow this fabulous herb in a pot that I keep close to the back door…I’m always using the leaves for something. During winter freezes I put the pot in the garage to protect the plant. When spring arrives, just trim back old growth and watch the new foliage sprout. Add flour mixture alternately with one cup of milk or half & half [add 1tsp. vanilla and 1 tsp. lemon pure extracts only to milk]…START with flour and end with flour…mixing well after each addition. ADD to the batter: grated rind and juice of one whole lemon and 1 cup chopped lemon verbena leaves…for a different flavor add organic lavender buds to the batter and you’ll have lavender –lemon flavor! FLORAL FLOURISHES…it’s great creative fun to make floral ice cubes to serve with herb tea. Simply fill ice cube trays ½ full with water and place an edible blossom or petal on top of the water in each cube. Then freeze until firm, fill the tray with more water and freeze again. EASY! Choose from: jasmine, violets, rose petals, dianthus, pineapple sage, hyssop, lavender…or any other edible blooms grown organically. To make my favorite blend for salad dressings, “Herbs de Provence”, I collect rosemary, thyme, marjoram, and savory to mix with dried lavender buds. Next, I’ll snip several rose blooms and dry the petals to add to my herb blend, for baking, and for making rose water. Glorious Flowers…The hydrangea blossoms are still a heavenly blue and will look great in my Italian stone jar…time to cut some of the largest blooms for drying. It’s so easy, I just cut the blooms, with as long a stem as possible… strip the leaves and then put the blossoms in a jar with about an inch or so of water…by the time the water is gone, the blooms should be dried. I’ve gathered more wildflower seeds for the side meadow…the guineas have scratched up the area really well so all I have to do is throw out the seeds next month and let the weather and Mother Nature do the rest…my favorites are larkspur, cosmos, tickseed, poppies, daisies and rudbeckia. LATE AUGUST…Early this morning I watched as the squirrels feasted on corn still on the cob, the goldfinches on thistle seed, the turkey and guineas on their scratch, the songbirds on sunflower chips and the hummingbirds performing aerial maneuvers while protecting their nectar feeders. Then it was time to get moving…so I ‘dressed’ the daylilies and cut down some of the onion chives to soil level…sprinkled some compost around the base of everything I had trimmed and then watered all heavily. Soon the lilies will bloom again and the chives will be up, fresh and green, too…for the third time this season. infested with slugs…use CHEAP beer and let it sit out until room temperature. Pour beer into the cans…about half full. That’s it! The next morning the little drunken thugs will be at the bottom of the cans…throw them in the compost pile and start again. PEST PATROL…going to pick up some guineas from a farmer friend…they are about a month old and will learn where their home is before I turn them loose on the garden…they will take care of bugs and slugs and especially ticks!! AND, will warn me if I have a visitor! Towards the end of August..Late in the day, the sky turns very dark, huge rumblings of thunder and ferocious lightening…purplish black clouds drop over an inch of needed rain. For the last several days this has happened, how wonderful, especially when the daytime temps are relatively cool…as in the LOW 80’s cool…still! Reminds me of years ago living in Florida! Ahhh… fragrant blossoms, birdsong and sometimes the unexpected from nature…With all the rain and cool temps for the past several days you’d think we were in England…in fact, our whole very lush green countryside does look a bit like…whoa, snap out of it! WAKE UP! 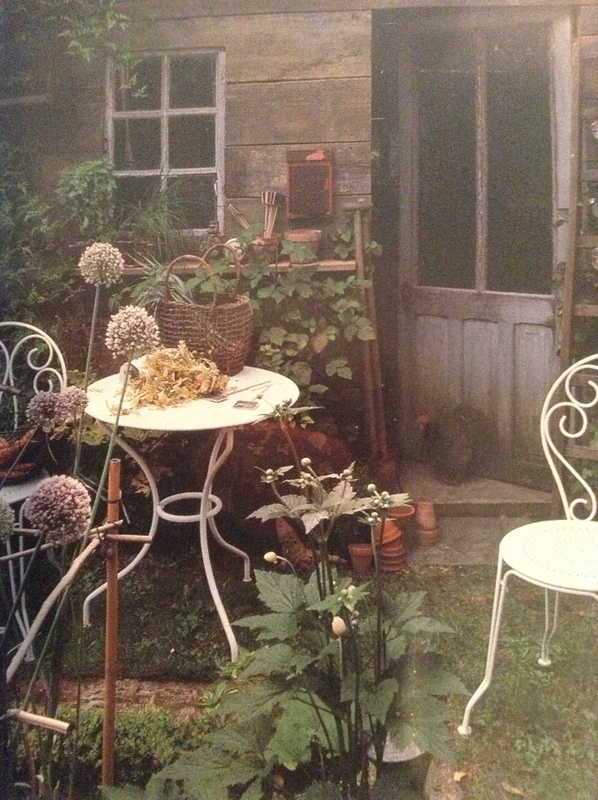 TALES FROM THE POTTING SHED…a few years ago in Texas, I came very close to losing some huge rosemary shrubs. Every morning for a week as I walked my yard I had found deep holes and piles of dirt thrown here and there in the part of my garden near the mercury vapor night light…a sure sign of an ARMADILLO attack! It was going after grubs down under my rosemary and other plants. Quickly I pushed the soil back into the holes and heavily watered the plants, and then covered the areas with more mulch. For three nights I patrolled the yard with Border Collies, Bear and Dougal, my old .22 rifle and a flashlight. The dogs sniffed out the first armadillo in a hole almost two feet deep under a shrub…I shot him as he dug! DON’T GET SQUEAMISH! He refused to fall for my trap and my plants are much more important to me, and…there really is NO shortage of armadillos in Texas. The next night, we found another one, this time under my favorite rose…same story as before. The attacks soon stopped, there were no more holes…and I marked on my calendar to later put out beneficial nematodes that will take care of the grubs in the ground! KNOW IT, GROW IT…give us our daily blooms. Few plants are as adaptable or as easy to grow as the day lily. Hailing from Asia, hemerocallis, or day lilies, were originally introduced to England for their medicinal and culinary properties…and eventually found their way to the new world with early settlers. Daylilies have many merits, the most obvious of which is the beauty of their flowers. They come in a wide spectrum of colors, from nearly white to yellow, apricot, gold, orange and deepest red, as well as pink, purplely and darkest maroon. Their size ranges from petite to whackingly big. Their equally diverse shapes vary from a pure open lily formation to rounded, double, flat or spider shaped. And, some have a superb fragrance! As the name implies, each individual bloom lasts only a day, but there are usually plenty more to follow giving several weeks of daily blooms. By selecting carefully from the early, mid and late flowering varieties available, you can have a splendid display of day lilies from early spring to late summer…plus, there are several varieties that will re-bloom 2-3 times in a season. The lovely, golden bell-like Stella de Oro has the greatest flower power of them all…having at least 4 or more bloom cycles in a season. Day lilies have attractive, arching, strap-like leaves that are worth including in the garden for their foliage alone. Some are among the earliest perennials to show up in the spring…as welcome as a spring shower. Around the garden, day lilies will happily fit in to most planting schemes…from full sun to filtered shade. They are stalwarts in the mixed border, but will look equally at home beside a pond, stream or water garden. Planted en masse, their arching foliage also makes them effective weed suppressors, especially on inaccessible places such as slopes. Day lilies come in a range of sizes from one foot to over four feet…the length of the flower stem…so when placing them in the garden, remember the height of the foliage should dictate the position of the plants, not necessarily the blooms. Care and Cultivation of day lilies is easy…being very hardy, they are amazingly tolerant of most conditions, but will positively thrive given rich organic soil and a sunny spot. In the spring they appreciate a top dressing with good compost and an occasional ground feeding with a liquid fish and seaweed mixture. To ensure a long display of flowers, deadhead bloom stalks at the base of the foliage every few days…do not allow seed pods to develop. Dig up and divide overcrowded, sparsely flowering clumps in late summer after blooming has stopped. Replant and amend soil with compost and rock phosphate. Remove any yellowed foliage from the base of the clump and cut back any old foliage in early winter before new growth emerges. In early spring aphids often attack day lilies…just blast them off with water or release ladybugs to clear up the problem. I think day lilies look great planted with tall, summer blooming phlox and masses of daisies. A few of my favorites: Hyperion, a tall, lemon yellow scented trumpet…pure white re-blooming Immortality and Gentle Shepard with ruffled white petals and a yellow green throat…creamy white Joan Senior, another re-bloomer…Catherine Woodbury, fragrant pink flowers with lime green throat…and the old-fashioned tawny orange, especially lovely mixed with bronze fennel…and many more with names I can’t remember. 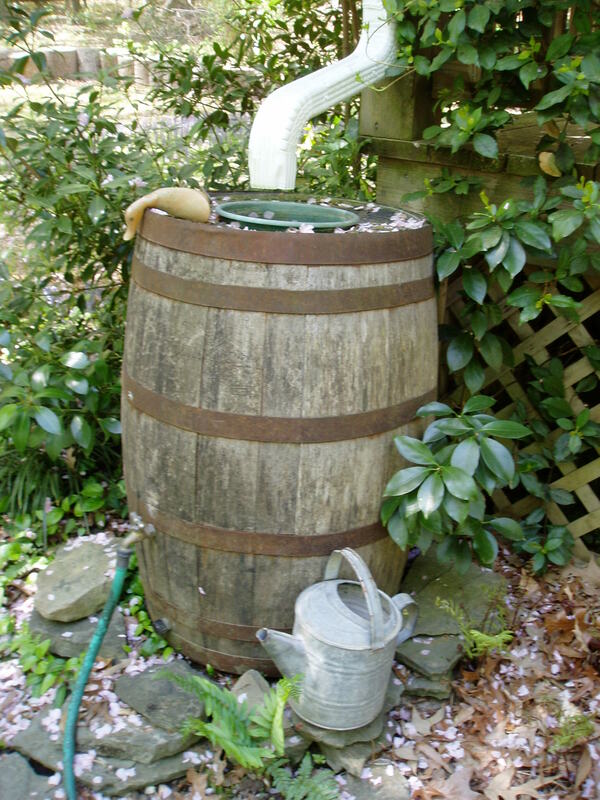 *I’ve used up most of the water from the rain barrels this week so I will take time to clean out whatever is lurking in the bottom of the barrels…EWWWW! This is one of the few times I carefully use bleach, it does kill most of the germs and bacteria…then I put some plain filter charcoal in the bottom of the barrels and wait for the next round of rain showers to fill them again. *Keep a sharp eye out for pests, especially mealy bugs…spray them off plants with a blast of water from the hose…if they persist, try spraying, CAREFULLY, with a great new all organic product called ‘Home and Garden Insect Spray’ from Green Light’s BIOGANIC group of OMRI approved products—it is a mix of thyme, clove, wintergreen and sesame oils and it works very well on many insects, so it is non-selective…oh, if you see something on plants that looks like a blob of white spit…well, that would be spit /spittle bugs…and same treatment applies…blast them with water! style…filled with trimmers, cotton string, folding knife, spray bottle with soap and water, small hand rake and whatever else you normally use…that way if something needs doing you don’t have to go find your tools. 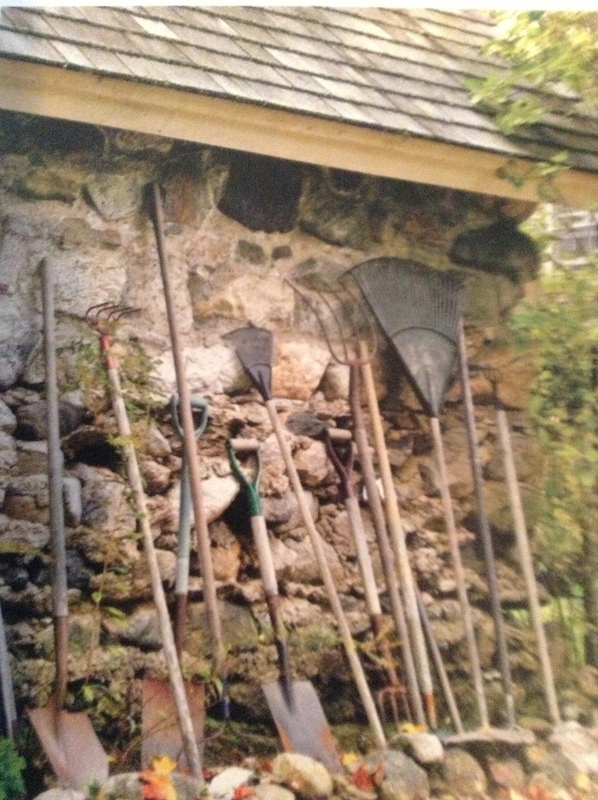 This applies to working on big projects as well such as planting…I gather all my tools, buckets for soaking, seaweed, amendment, water can, compost and mulch and pull it around to where I’ll be working…that way I don’t have to make so many trips back to the barn for what I FORGOT! Oh, I also put up an old mailbox on a post in the back yard to hold some clippers, gloves and digging fork…just in case something needs to be done while out walking the yard. The beginning of autumn…in just a few weeks so I must make up my mind to it, plant the fall garden…on some days I think it is the most richly beautiful season of all.